Members in the Bcl-2 family are critical regulators of apoptosis by either inhibiting or promoting cell death. Bcl-2 homology 3 (BH3) domain is a potent death domain (reviewed in 1 and 2). BH3 domain containing pro-apoptotic proteins, including Bad, Bax, Bid, Bik, and Hrk, form a growing subclass of the Bcl-2 family. A novel BH3 domain containing protein was recently identified and designated Bcl-G (3). 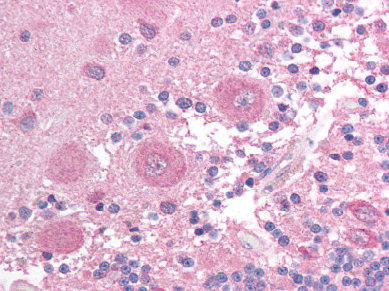 The mRNA of Bcl-G encodes 2 isoforms, Bcl-GL, which is widely expressed in multiple tissues, and Bcl-GS, which is only found in testis. The Bcl-GS protein is predominantly localized to cytoplasmic organelles whereas Bcl-GL was distributed throughout the cytosol. Overexpression of either protein induced apoptosis, although Bcl-GS was far more potent than Bcl-GS. Apoptosis induction was dependent on the BH3 domain and could be suppressed by co-expression with the anti-apoptotic Bcl-XL protein (3). 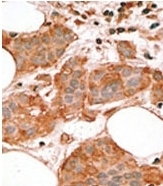 BCL2L14 monoclonal antibody (M01), clone 1F2 Western Blot analysis of BCL2L14 expression in A-549 ( Cat # L025V1 ). Detection limit for recombinant GST tagged BCL2L14 is approximately 0.03ng/ml as a capture antibody. Western Blot analysis of BCL2L14 expression in transfected 293T cell line (H00079370-T01) by BCL2L14 MaxPab polyclonal antibody.Lane 1: BCL2L14 transfected lysate(35.97 KDa).Lane 2: Non-transfected lysate. Western Blot analysis of BCL2L14 expression in transfected 293T cell line (H00079370-T02) by BCL2L14 MaxPab polyclonal antibody.Lane 1: BCL2L14 transfected lysate(36.60 KDa).Lane 2: Non-transfected lysate. 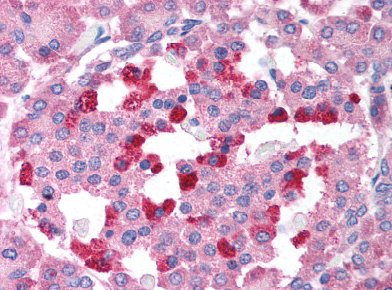 Formalin-fixed and paraffin-embedded human cancer tissue reacted with the primary antibody, which was peroxidase-conjugated to the secondary antibody, followed by AEC staining. This data demonstrates the use of this antibody for immunohistochemistry; clinical relevance has not been evaluated. Western blot analysis of anti-Bcl-G BH3 Domain Pab (Cat. #AP11296PU-N) in K562 cell line lysates (35ug/lane). Bcl-G BH3 Domain (arrow) was detected using the purified Pab. Immunohistochemical staining of mouse testis tissue using BCL2L14 polyclonal antibody ( Cat # PAB12903 ) at 2 µg/ml. Western blot analysis of BCL2L14 in U-937 cell lysates with BCL2L14 polyclonal antibody ( Cat # PAB12903 ) at ( A ) 2.5 and ( B ) 5 µg/ml. Western blot analysis of Bcl-G in U937 cell lysates with Bcl-G antibody at (A) 2.5 and (B) 5 ug/ml. 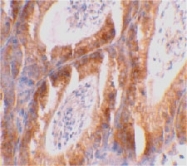 Immunohistochemical staining of mouse testis tissue using Bcl-G antibody at 2 ug/ml. 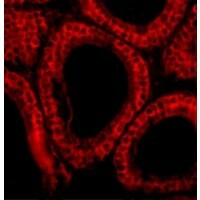 Immunofluorescence of Bcl-G in Mouse Testis cells with Bcl-G antibody at 10 ug/mL. 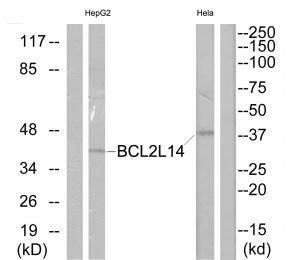 Western blot analysis of extracts from Hela cells and HepG2 cells, using BCL2L14 antibody.The lane on the right is treated with the synthesized peptide.